In this frame, we are getting to the Area 51 Radar Range, used for various radar and Radar Cross Section (RCS) tests. 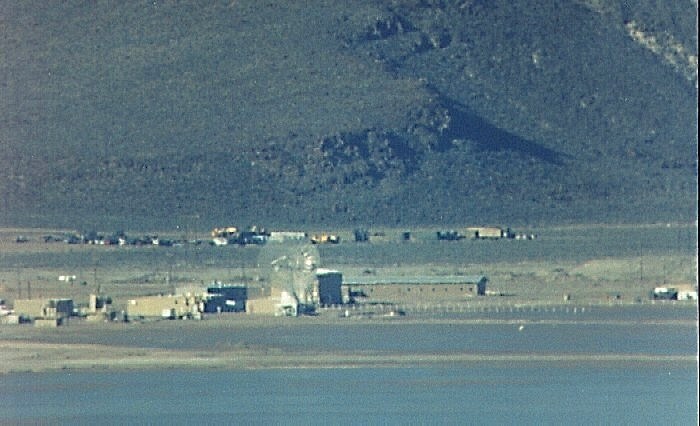 The building on the far left is Building 120, the Range Maintenance Shop. The taller building to the left of the large dish is Building 122, the Range B. E. Office. The low building at the base of the dish is Building 123, the Dish Antenna Building. The tall building behind the dish is relatively new, as is the long low building behind it. The latter is located at the intersection of 1st Street and EG&G Road, a little southeast of Building 130. The vehicles and equipment in the background is an apparent storage yard across from the big Shipping & Receiving complex. This is also where the workers driving up from Mercury have to park their private vehicles, which are not allowed on base.